Technically resistance tubes are made of rubber compound while its cousin, resistance bands, are most commonly made from flat strips of latex. 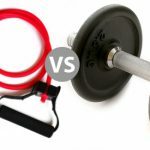 Manufacturers tend to use the term “resistance bands” to describe both types interchangeably. Don’t be fooled however; there are meaningful differences between the two as well as pros and cons to consider. A key advantage of flat resistance bands is greater comfort in use. When you’ve got the band wrapped around a foot to do curls for example the pressure is evenly distributed. Since tubes are comparatively thin, the pressure is noticeable against your body which some may be bothersome to some depending on the application. It’s ideal for travel as flat bands can be folded and fit into tight spaces in suitcases. To top it off, they’re lighter than tubes. Better for kids, older folks with weak joints, or simple rehabilitation exercises. 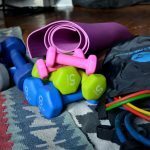 May be the best choice for specific exercises associated with Pilates and yoga in which increasing ones strength is not the key motivating factor for exercise. They are much more likely to snap! After a certain amount of use, latex resistances will fail so it’s best to anticipate it, and have backups on hand. In addition, you can’t stretch flat resistance bands as aggressively as tubes as this will also lead to it snapping. Luckily, when it does happen it doesn’t feel like a dangerous event as it does with tubes! While kits are available with several flat bands with varying resistance ratings (x-light, light, medium, heavy, x-heavy), there aren’t as many choices as with resistance tubes. The strongest flat band cannot compare with the strongest resistance tube. Tubes offer more choices in terms of resistance for different applications (ex. 3 lbs, 5 lbs, 8 lbs, 13 lbs, 19 lbs, 30 lbs). For serious athletes and strong individuals, tubes are better for heavier exercises. Fans of programs on the more intense side such as P90X, P90X3 and FOCUS T25 will prefer to stick with tubes. 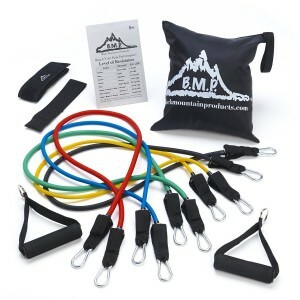 Kits tend to get more extensive with as much as 31 pieces included with the Bodylastics Mega Resistance Bands set. Door anchors, handles, ankles straps and even carrying cases are included in any decent set. These may cause mild discomfort and temporary red marks from the tube pressing against your body as the pressure in concentrated into a much thinner area than with flat bands. You wouldn’t want to be doing an exercise with a door attachment when a resistance tube snaps and have it shoot back at you. Yes, tubes are stronger and less prone to breaking but if it happens it could cause minor injury. Stay away from cheap resistance tubes and knockoffs. Don’t stretch a band without a “snap guard” core beyond what seems reasonable and you’ll be fine. Not as portable as flat resistance bands. 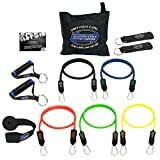 Since resistance bands are so inexpensive this isn’t really a choice you even need to make. Your best option may be to have both types on hand for different situations. Even if you’re a serious athlete that typically prefers the higher resistance ratings available in tubes, flat bands are still ideal for travel.